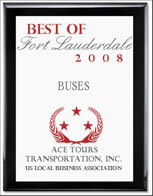 Bus Charter Rentals - News | Ace Tours Inc.
We are pleased to announce that Ace Tours Transportation, Inc. has been selected for the 2008 Best of Fort Lauderdale Award in the Buses category by the U.S. Local Business Association (USLBA). The USLBA 'Best of Local Business' Award Program recognizes outstanding local businesses throughout the country. Each year, the USLBA identifies companies that we believe have achieved exceptional marketing success in their local community and business category. These are local companies that enhance the positive image of small business through service to their customers and community.